Welcome to the October installment of the Virtual Book Club for Kids! This month, our spotlight author is Julia Donaldson and I am super excited about our book of the month and our language building activity to go along! Stick Man lives in his home with his family when one day he gets carried off by a dog who thinks he makes a great fetching toy. We follow poor Stick Man along as he is swiped up here and there and dragged farther and farther from home. He is finally rescued by none other than Santa Claus himself and brought back home to his family! This book is an excellent new addition to our holiday library! 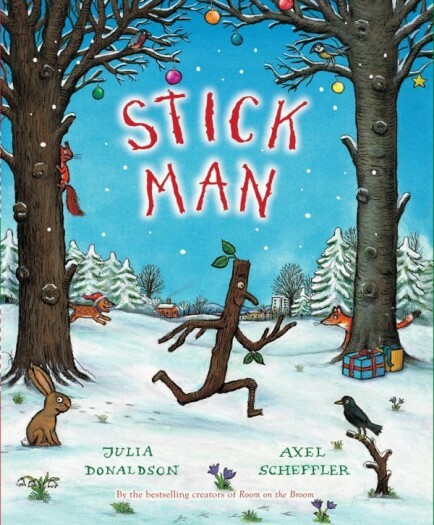 Stick Man is authored by Julia Donaldson, who you may recognize from The Gruffalo and one of my most favorites, Room on the Broom . Donaldson’s books are full of creative, rhyming language with amusing story lines that children just adore. As I’ve mentioned previously, I want my activities to be SIMPLE, EASY and yet provide new experiences to help build and support speech, language and communication skills in young children. I want to provide activities that I think most people can do in their own homes easily. 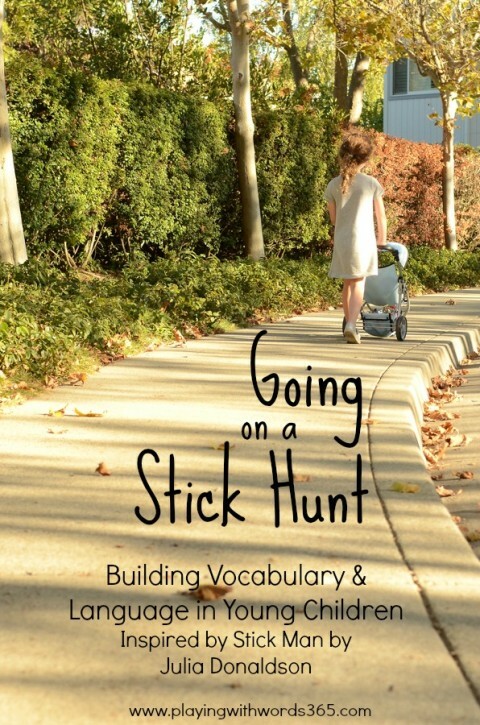 Our Stick Hunt fits the bill! For Stick Man, I decided to take the learning outdoors and go on a Stick Hunt. We explored different language concepts by looking for sticks of different attributes like LONG, SHORT, FAT, THIN, etc. 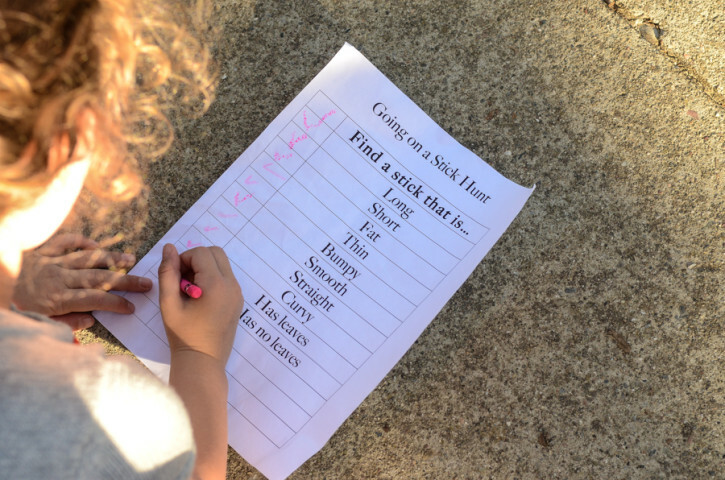 I made this scavenger hunt-type list for each of my “big” kids (almost 6 and 3 years, 9 months) so they could keep track of which types of sticks they found on our stick hunt. We then headed out and tried to find at least one stick with each attribute. And of course they loved checking off our finds along the way! 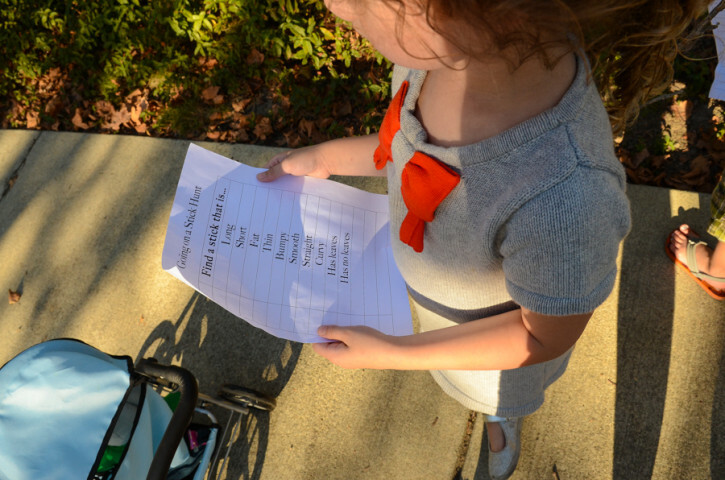 Scavenger hunts like this one are FANTASTIC for speech & language skill building. They provide opportunities for teaching targeted vocabulary in a very FUN and PLAYFUL way. I recommend using PICTURES with young children as well as with children with language delays, rather than just words as I used here. (My daughter was working on reading the words while my son was working on identifying the beginning letters and sounds in addition to the language use during this activity). 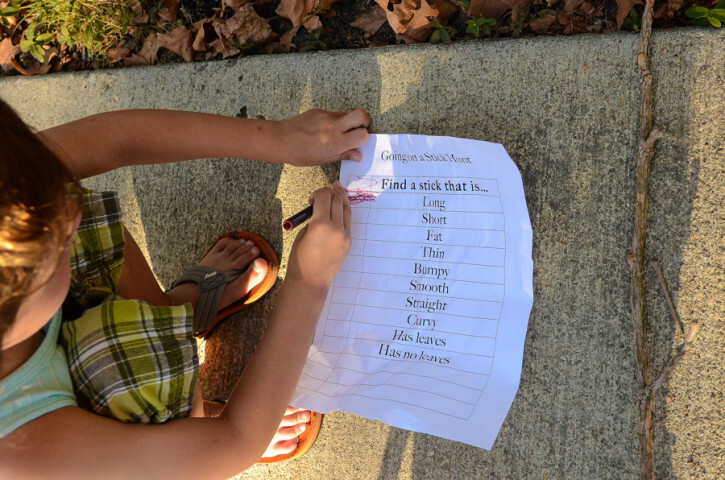 Have you ever done a scavenger hunt? Check out these Julia Donaldson Inspired Activities from the Virtual Book Club for kids Bloggers!